Our fine line Of Citecar Transit Buddy Shuttles offer several models which will serve those who need the ability to carry wheelchair passengers as well. We are the experts at all issues pertaining to transporting wheelchairs in electric vehicles and all ADA regulations as well. Depending on whether you need one or two wheelchair positions, we have the proper vehicle for your needs. 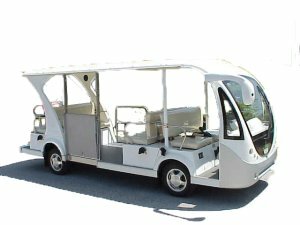 We have open air models as well as fully enclosed shuttles that can serve your wheelchair transportation needs. We specialize in knowing what requirements are necessary , if you just want a "wheelchair shuttle" or for those clients that must have an "ADA wheelchair shuttle".Please ask our sales representative which type of shuttle your particular application may require.